Delivering image clarity, illumination and field of view unrivaled-even with zero ambient light-our new Equinox series raises the bar. Where increased depth perception is critical, our super-bright Gen 1 model packs more intensity than any Gen 1 optic before it. It's marked by a lightweight, compact housing, extremely long battery life and true 2x magnification. All models have rugged, water-resistant housings and integrated accessory rails. Delivering image clarity, illumination and field of view unrivaled-even with zero ambient light-our new Equinox series raises the bar industry-wide in digital and Generation 1 night vision. The two digital models pierce the night with utmost efficiency, offering the option of a traditional green view for dusk and dawn while some ambient light is available, and white imaging for use in almost-dark to completely dark conditions. Where increased depth perception is critical, our super-bright Gen 1 model packs more intensity than any Gen 1 optic before it. 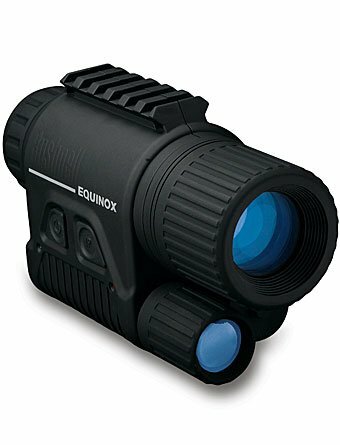 It's marked by a lightweight, compact housing, extremely long battery life and true 2x magnification. All models have rugged, water-resistant housings and integrated accessory rails. No telling how youll react when faced with what lurks after dark, but with Bushnell® Night Vision, time will never again dictate your hours of operation. 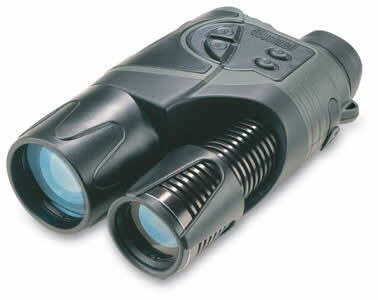 These optics turn night into day with built-in infrared illuminators and advanced light-gathering technology. We even added a new StealthView digital model that uses an infrared spotlight for long-range brightness and clarity. The entire lineup is perfect for camping, caving, wildlife observation, surveillance  any time or place you think youre ready. 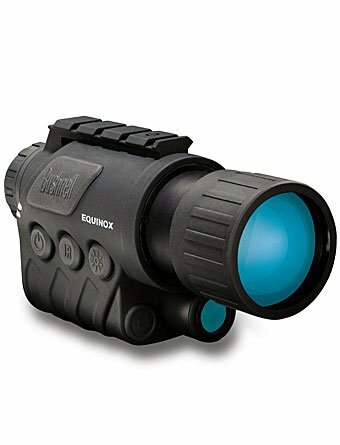 Images comparable to Gen 2+ CMOS vs image-intensifier tube In-view B&W micro display Adjustable eyepiece Powerful infrared spotlight 600-feet viewing range Weather resistant Video output Built-in tripod mount Operates on 6 AA batteries 2-hour continuous run time w/IR on and 8 hours without IR. Scouting game Security and surveillance Camping fun / Exploring caves Nighttime navigation Night fishing and boating Wildlife observation Search and rescue.